While we were walking south from Englewood Beach toward Stump Pass State Park looking for shells and shark teeth, three teenage girls came running up talking so fast we could hardly understand a word. 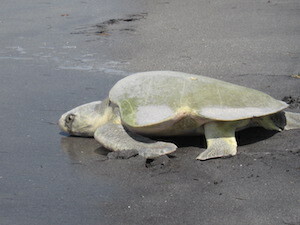 After catching a breath they said, “Hurry, she’s laying her eggs, we watched her come out of the water, climb up the sand dune… she’s so huge, the biggest turtle we ever saw!” Then they were off. The quintessential wet and wild springtime sighting of endangered green sea turtles coming home to lay their eggs is simply magnificent, an instinct-driven ceremony of flippers whipping sand in every direction, building a nest to incubate the next generation. Spent from the ordeal of digging and then dropping and covering her eggs, she slowly returns to the gulf waters. With luck she will be back next spring to lay another 75 to 200 eggs. According to Ranger Rick and “Turtle Lady” most sea turtles lay their eggs under the cover of darkness but greens will venture ashore during daylight. Forget crowded beaches, hike undeveloped coastline. Enjoy the feeling of seclusion and chances of spectacular sightings. Dolphins, manatees, black skimmers, pelicans flying in “V” formation, and herons or egrets begging fishermen for a free lunch are just a few. And with a bit of luck, the greens. 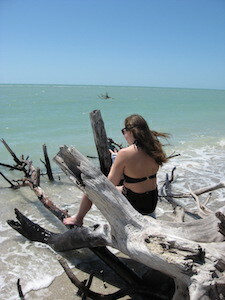 Stump Pass State Park is just south of Englewood Beach. Open 8:00 a.m. until sunset year round. The entrance fee is only $3, so get there early to snag one of the 58 parking spots. Amenities include freshwater showers, handicap accessible restrooms, picnic pavilions, and boardwalks. 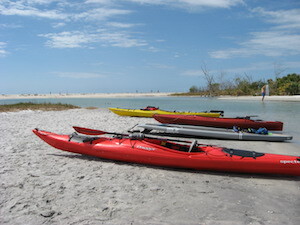 Additionally, a beginner-level hiking trail loops the peninsula from the gulf side to the intercoastal. Don’t forget your sunscreen!